Advance supports organizations and charities within and around our corporate headquarters in Southern California, and at both of our plants in Cedartown, GA and Salt Lake City, UT. Team members at our Cedartown Plant collected toys and food for the holiday season and delivered some holiday cheer to GA families in need. On October 24th, team members at all 3 Advance locations stepped up with donations towards breast cancer research in honor of Breast Cancer Awareness month. Great job Advance Team! 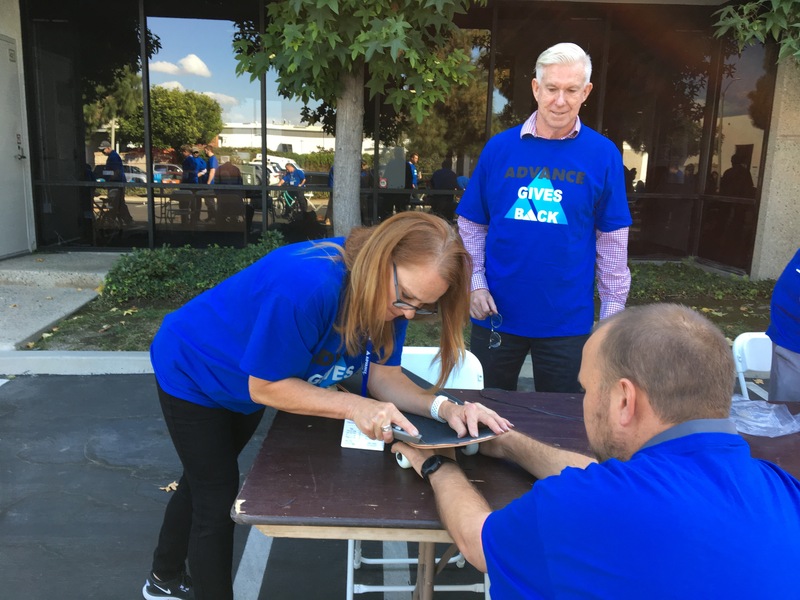 On October 11th, Advance Storage Products partnered with Together We Rise to build bikes and skateboards for children in foster care. Team members from all locations gathered in Huntington Beach and worked together to build 15 bikes, 15 skateboards and to decorate and fill 100 birthday boxes. All three Advance locations are participating in a backpack/school supplies drive. So far several barrels and boxes have been filled! The HB office got a head start on July 4th celebrations by having a BBQ on July 3rd. Advance sponsored movie night for the community at the Old Rockmart High School football field which included games for kids, hot dogs, popcorn, chips, water, lemonade and door prizes while watching a screening of Peter Rabbit. The Advance Team in Cedartown, GA collected 4 boxes of food for a local food pantry in the month of May. The food is sorted out by family size and available for pick up by needy families in the area. Cedartown also held yet another successful Blood Drive with 17 team members donating blood in May. Our Cedartown Plant had a blood drive on March 8th and we had 20 team members donate blood. A decision to donate your blood can save a life, or even several if your blood is separated into its components (red cells, platelets and plasma) which can be used individually for patients with specific conditions. Advance collected toys and money donations for the local Boys & Girls Club in Cedartown, GA. Boys & Girls Clubs work to save and change the lives of children and teens, especially those who need us most, by providing a safe, positive and engaging environment. The Advance Gives Back Team in CA headed out to the Ronald McDonald House in Long Beach and made burgers and hot dogs for lunch on March 29th. The Cedartown, Georgia team members reached out to the local CASA group and received gender, ages and a wish list for 7 local children. The team was able to get everything on the list and more. Each child received a stocking filled with necessities such as toothbrushes, toothpaste, socks & soap and of course coloring books. Each child received a bike or riding toy plus new shoes, PJ’s and clothes. Volunteers from the Huntington Beach office once again went to the Ronald McDonald House in Long Beach and made breakfast for the residents on December 5th. Members of the Advance Team volunteered preparing and baking a variety of snack items including fruit cups, cupcakes, and cookies at the Ronald McDonald House in Long Beach, CA. Since 1974, Ronald McDonald House Charities has helped address the everyday needs of families helping a sick child fight their illness. A Ronald McDonald House provides a place for families to call home so they can stay close by their hospitalized child at little to no cost. Some members of the Advance Gives Back Team volunteered at Second Harvest Food Bank sorting and repackaging food donations. Second Harvest reaches out to the community for donations, grants, fundraising, food drives, food rescue, harvesting and volunteers to help provide food, education and advocacy for the hungry. They work with partners in the community to create innovative, sustainable ways to end hunger in Orange County, California.